Villanova Wildcats men's basketball players parade around City Hall during Thursday's championship parade, April 5, 2018. Thousands of Villanova fans reveled in another NCAA basketball championship on Thursday as the Wildcats paraded through Philadelphia. The Villanova players road atop a Big Red Bus adorned with a championship banner as coach Jay Wright tossed championship t-shirts to fans. 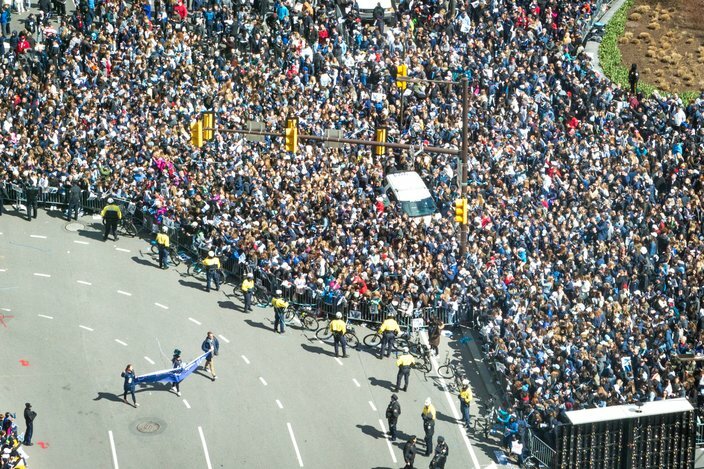 Blue and white confetti was shot into the sky as the parade moved down Market Street toward Dilworth Park, where it culminated with a rally in the shadows of City Hall. Fans sounded air horns and held signs reading "Villy Villy" and "Nova Nation." The celebration marked the second time in three years that the Wildcats paraded through Philadelphia, having also captured a national championship in 2016. “I didn’t think it would happen twice, yet here I am lucky enough to experience it again,” said John Garvey, a 22-year-old senior at Villanova. The procession was led by cheerleaders hoisting a championship banner and flags spelling out Villanova. Players from the university's 1985 and 2016 championship teams – and some alumni – rode along in convertibles. It also included a trio of fire trucks from suburban fire companies, team broadcasters and the school's marching band. Near the start at 20th and Market, the crowd was only one or two rows deep, but more fans awaited farther east on Market, closer to the site of championship ceremonies at Dilworth Park. The Wildcats enjoyed a similar parade celebration two years ago, when the Wildcats also carried the championship trophy along Market Street. When this season began, Safi Najdawai, 33, of Bryn Mawr, Montgomery County, thought Villanova only would advance to the Sweet 16 or Elite Eight. But about halfway through the season, Najdawai said he realized the team could be something special. "During the year, we didn't have the expectations," said Najdawai, an alumnus and a longtime season-ticket holder. "We knew they'd be good, but we didn't think they'd be this good." His wife, Katie, 32, said she became most excited at the start of March Madness, knowing the Wildcats had an opportunity to make another deep run. "I think the fan base is more confident and more supportive because of what happened two years ago," said Katie Najdawai, an alumnus who was on Villanova's dance team. The crowd at Dilworth Park packed in tightly against the barriers while awaiting the arrival of the Villanova Wildcats men's basketball team during the championship parade, Thursday, April 5, 2018. Once the Wildcats reached Dilworth Park, Wright spoke to the throng of fans before introducing his players. "We are so proud to represent the Big 5, the Big East and, most importantly, the City of Philadelphia," he said. Sophomore Donte DiVincenzo and juniors Jalen Brunson and Mikal Bridges drew the loudest cheers from the crowd as they were introduced. The trio each addressed the crowd, as did junior Phil Booth. But they kept their remarks brief. "What's going on Nova Nation?" Bridges shouted into the microphone. "I appreciate you guys coming out today. It means a lot. I love you guys so much." The celebration capped a thrilling month in which the Wildcats rolled past their opponents in the NCAA Tournament to capture the school's third national title. "The fact that it happened twice in three years was incredible," said Alexis Domenick, 24, who was a senior when Nova won in 2016. "It's just as sweet." 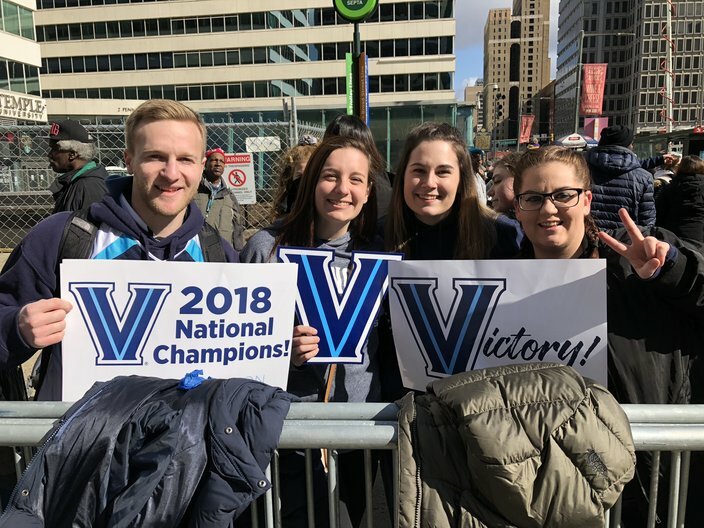 Villanova students and alumni Alec Fischman, Alexis Dominick, Sarah Dominick and Chelsey Hartsock await the start of the Wildcats' NCAA Championship parade on Thursday. The parade route will take the team along Market Street to Dilworth Park. Villanova topped Michigan, 79-62, Monday night in the National Championship game played in San Antonio. Behind 31 points from sophomore Donte DiVincenzo, the Wildcats led for most of the game. That differed from the university's last championship, a back-and-forth contest against North Carolina that came down to a buzzer-beater by Kris Jenkins. Still, Villanova only has three players who appeared in games during both championships seasons – Bridges, Booth and Brunson, a starter in both seasons. "I think they were both magical seasons," said Alec Fischman, 24, a 2016 alumnus. "The players did their part, but also coach Wright – he had a game plan for every game. Even when they were down in the tournament, they stuck together." John Rilley, 45, of Wayne, said this season brought a different feeling than 2016, especially with freshmen stepping up when players suffered injuries. But the championship quickly brought him back to where he was two years ago. "I traveled with the team (throughout the NCAA Tournament) in both 2016 and 2018," said Wayne, a former Villanova football player. "I must say, hearing the final buzzer and the fireworks and the confetti coming down brought me right back to the 2016 Jenkins' moment." 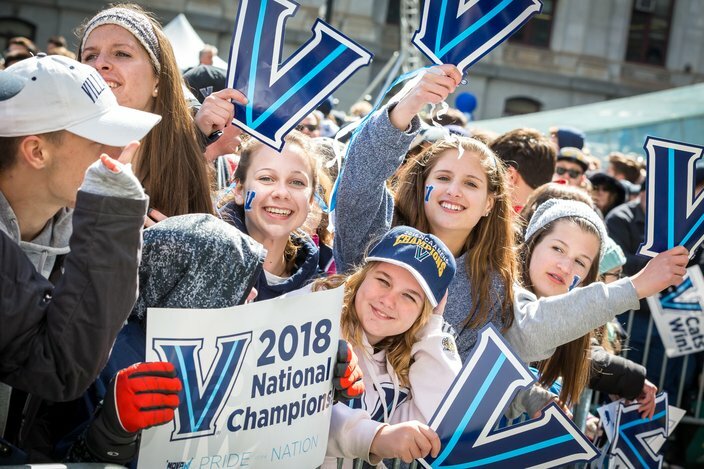 Fans at Dilworth Park awaits the arrival of the Villanova Wildcats men's basketball team during the championship parade, Thursday, April 5, 2018. Amber Ruest, 33, of York, recalled the passion Wright exhibited on the sidelines when she was a student at Villanova more than a decade ago. The farthest the Wildcats advanced during her tenure was the Elite Eight. That came in 2006, when Villanova captured its first No. 1 seed under Wright, but fell to the eventual champions, Florida. Now, Wright has built Villanova into a perennial contender. "He's really matured at his position," Ruest said. "Instead of just creating a team, he's created a program."